A 4 1/2” clay sporting bird travels over 47 mph and you need to hit it with an 18“ pattern somewhere around 22 yards. 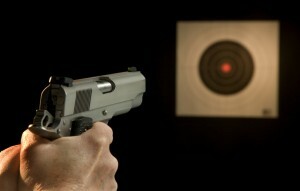 The bulls eye on a fifty yard target is less than 1“ in diameter. A yellow lens filters blue light. Blue light is that part of the visible spectrum that strikes water particles in the air creating fog. The right color lens can enhance your target picture and improve your shooting. Guard arms, comfort cables, prescription adjustment for wrap around lenses are just some of the variables that we can offer you to improve the comfort and wearability of a shooting glass frame. The eyecare professionals at Parrelli Optical offices in Beverly and North Andover know what you are shooting at and can help you hit your target. At Parrelli Optical® we specialize in shooting glasses. Randolph Engineering Shooting Glasses are only available at Parrelli Optical® in Beverly and North Andover.